Werner is active in many musical organizations in Huntsville and the surrounding area. 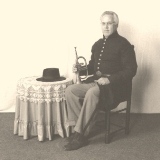 He is formerly principal trumpet for the Huntsville Symphony Orchestra and for the Huntsville Opera Theater. He has been a member of the Richard Cox Big Band, the Charlie Lyle Orchestra, and the jazz combo, Swing Shift. He is currently playing with Olde Towne Brass, First Baptist Church Orchestra, the Brass Band of Huntsville, Bavarian Saurkrauts, FBC Praise Band, and Little German Band. He regularly plays in local theatrical and other musical productions, and teaches at Valley Conservatory. Werner is a father of two and has his own special Wedding Trumpet page. 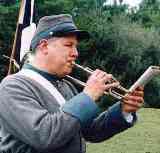 Werner plays an original Eb Cornet with Olde Towne Brass.